Google spent a lot of time and effort trying to convince everyone that Chrome OS isn’t just for laptops. The fruits of the company’s labor have been slowly revealing themselves over the past year through software updates and the few Chrome OS tablets that are already available. 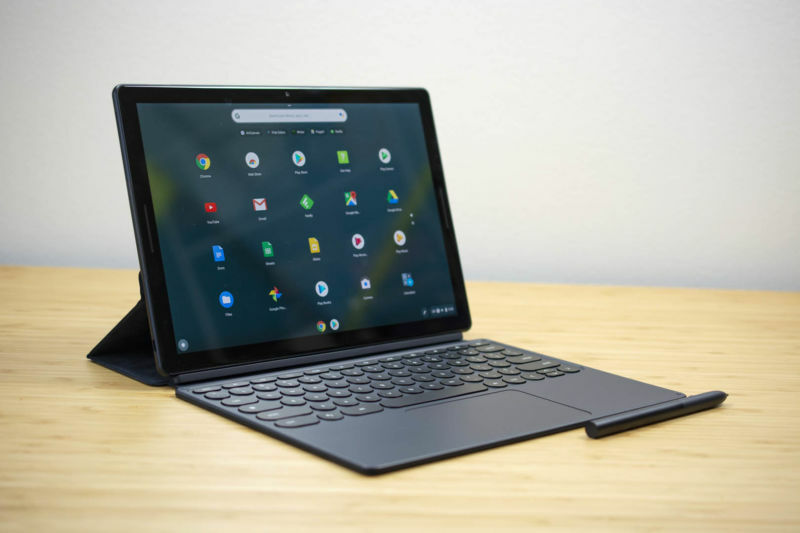 But Google officially ushered in the era of the Chrome OS tablet with its own Pixel Slate, which it announced last month alongside the Pixel 3 smartphone. The first Google-made tablet in three years is now available for purchase. And you can think of the Pixel Slate as a not-so-distant cousin of the company’s premium Chromebook, the Pixelbook, in that it appeals to those who have chosen Chrome OS as their primary operating system and demand only the highest-quality hardware for it. The Pixelbook, while certainly the most Googley Chromebook, has proven to be only one of the best Chromebooks available. Similarly, the Pixel Slate has a lot of things going for it—namely its chic design, support for powerful Intel processors, and a bunch of storage and memory—but it falls into the same traps as the Pixelbook did regarding productivity and price. The Pixel Slate may not share a silver-and-white aesthetic with the Pixelbook, but it still has a clean design, now just with a darker hue. The all-metal back sports a deep navy color with a slightly lighter blue “G” on the top-left corner. The rear 8MP camera sits on the top-right corner, leaving the rest of the slab unmarred by embellishments. However, the Slate’s back collects fingerprints and smudges like my 10-year-old self collected Pokemon cards, so don’t expect the metal to stay pristine for long. Nevertheless, it’s a sturdy tablet that doesn’t easily bend under pressure. Uniform black bezels surround the 12.3-inch, 3000×2000, 293ppi display, giving your fingers room to grasp the tablet in both portrait or landscape orientations. The display produces rich colors and gets decently bright (Google wouldn’t provide the maximum brightness in nits, but our colorimeter measured 362 nits at full brightness). It responds to touch and pen input well, but the display’s viewing angles aren’t the greatest: direct sunlight and environments with oodles of light produce lots of screen glare. Two front-facing speaker grills sit on both short-side bezels and deliver decent sound no matter what position the Slate sits in. While they fill my small office with sound, they’d be hard-pressed to fill my entire living room, let alone my whole apartment. The edges along the sides of the Slate are smooth, corners are rounded, and the device measures just 7mm thick while weighing 1.6 pounds. Google stuck two USB-C ports on either side of the Slate, allowing you to charge the device comfortably regardless of where your power source is. A headphone jack is absent on the Slate, as it is on the Pixel 3 smartphone, which is a disappointing but unsurprising reality. Pogo pins on one of the longer edges connect to compatible keyboard cases, and a new fingerprint sensor sits on the opposite edge. The USB-C ports, while not Thunderbolt 3 compatible, also let you connect to peripherals and dongles, so you can import data from other sources and connect to an external 4K display (Bluetooth accessories like mice are compatible as well). Unlike iOS’ Files app on the new iPad Pro, Chrome OS’ Files app gives you access to data on external drives that are connected via USB-C. You can drag-and-drop or copy files from such a drive to the Pixel Slate’s onboard storage, or you can move them to your Google Drive storage as needed. While the Pixelbook stood out more among other Chromebooks (and certainly from other laptops in general), the Pixel Slate is more subdued. That’s not a bad thing, especially because Google still infused enough of its signature cleanliness and modernity into its design. The Slate forgoes metallic accents, diamond-cut edges, and gimmicky design elements. Instead, it follows the Swedish concept of “lagom,” or “just enough” (which, depending on your personal taste, is either great or terrible). The Slate is the first Chrome OS device to have a fingerprint sensor, dubbed “Pixel Imprint.” The operating system didn’t previously support biometric login. While the device has an 8MP front-facing camera, you won’t find an IR camera on the Slate (the front-facing camera is mostly for Duo video calls). But a fingerprint sensor is better than nothing, and setting it up requires the same, repetitive press-and-lift motion atop of the reader for a few minutes. Once your fingerprint has been recorded, you can use it to login to your Google account just as you would on a macOS or a Windows device. The reader lies atop the power button, so you can press and hold it to boot up the Slate. However, the fingerprint reader does come with a strange idiosyncrasy—you cannot power on the Slate and login at the same time. Since the fingerprint reader and power button are one and the same, like they are on the Huawei Matebook X Pro, you’d think that you’d be able to press and hold once to turn on the device and log in to your account. But that’s not the case: doing that will only turn on the device and bring up the traditional login screen that asks for your password. Essentially, you can only use your fingerprint to unlock the Slate’s screen from sleep—but you need to make a PIN first to do so. While Chrome OS on the Slate asks you to set up a fingerprint reader upon setting up the device for the first time, it doesn’t ask you to make a PIN to accompany your fingerprint and password. However, you must enable the PIN or password login option in your personal settings before you can use your recorded fingerprint at all. Windows Hello requires you to create a PIN before registering a fingerprint, so that process isn’t unheard of. However, I assumed that I’d be able to use my finger to log in to the Slate immediately after recording it because I wasn’t asked to make a PIN at that time. It’s also baffling that your fingerprint can wake the device from sleep but not login initially after powering on. When asked about this, Google explained that this is a security measure for its Made By Google devices (like the Pixel smartphones), designed to better protect the device from unauthorized logins from bootup. Nevertheless, I’m glad Google finally brought fingerprint authentication to Chrome OS and to its own Chrome OS tablet. It’s long overdue, and combined with the Titan C chip inside the Slate, it makes the device more secure overall. Google developed the Titan C chip specifically for Chrome OS devices, but the newer chip essentially accomplishes the same things as the Titan M chips inside Pixel 3 devices. That means it helps with the secure boot process, storing the most up-to-date version of Chrome OS and preventing others from reverting your system back to a less secure version. It also provides screen protection with login attempt limits, on-device encryption, and other security features.